^ 1.0 1.1 MC-21 programme proceeds to assembly phase. Flight Global. 31 January 2014. ^ PARIS: Irkut to build first MC-21 by year-end. Flight Global. 2013-06-19 [2017-07-26]. ^ Sukhoi wins bid to build wings for new MS-21 passenger plane. Moscow: RIA Novosti. 13 March 2008 [18 December 2008]. ^ PARIS: Irkut forges ahead with MS-21 work. Flightglobal.com. 19 June 2011 [23 June 2011]. （原始内容存档于2011-06-23）. ^ MC-21: Russian high-tech plane rolls out to challenge Airbus 320, RT News, 2016-06-08. ^ Irkut rolls-out MC-21 airliner in bid for single-aisle share, Flight Global, 2014-06-08. ^ Aviadvigatel to showcase test PD-14 engine at MAKS-2015 airshow, www.ruaviation.com, 2015-08-18. ^ Russia's United Aircraft to develop new twin-jet , FlightGlobal, 2012-09-04. ^ Aeroflot plans up to 50 MS-21s as part of effort to support Russia’s airliner industry. Flightglobal.com. 1 September 2010 [1 September 2010]. 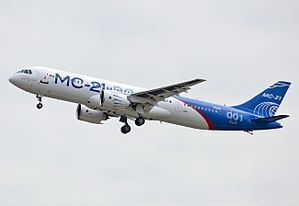 ^ Irkut lost his only hard contract for MC-21 (article in Russian) "Иркут" лишился единственного твердого зарубежного заказа на МС-21. www.vedomosti.ru. 2012-07-10 [2016-06-10]. ^ "Ильюшин Финанс Ко." займется продажей самолётов МС-21. aex.ru. [7 April 2015]. ^ MAKS: Ilyushin Finance orders 28 MS-21s. [23 August 2011]. ^ Rostekhnologii and IFC sign for up to 135 MS-21s. [23 August 2011]. ^ Reed Business Information Limited. Irkut. flightglobal.com. [7 April 2015]. ^ IrAero will acquire 10 MS-21s - News - Russian Aviation - RUAVIATION.COM. ruaviation.com. [7 April 2015]. ^ Reed Business Information Limited. MAKS: Red Wings signs for Russian jets and Q400s. flightglobal.com. [7 April 2015]. ^ Thomson Reuters Africa. Russia's Irkut to sell six MC-21 airliners to Egypt's Cairo Aviation. af.reuters.com. [11 November 2015]. ^ Лысцеваwrote, Марина; 10:03:00, 2016-06-08 10:03:00 Марина Лысцева fotografersha 2016-06-08. МС-21 впервые показали широкой публике!. [2016-06-08]. （原始内容存档于2016-06-11）.